158 pages | 36 B/W Illus. Recent shifts in new literacy studies have expanded definitions of text, reading/viewing, and literacy itself. The inclusion of non-traditional media forms is essential, as texts beyond written words, images, or movement across a screen are becoming ever more prominent in media studies. Included in such non-print texts are interactive media forms like computer or video games that can be understood in similar, though distinct, terms as texts that are read by their users. This book examines how people are socially, culturally, and personally changing as a result of their reading of, or interaction with, these texts. 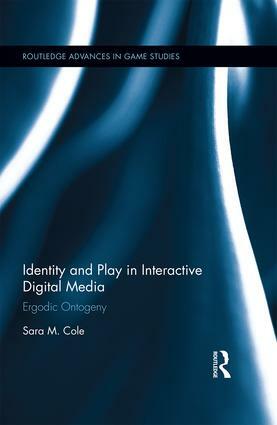 This work explores the concept of ergodic ontogeny: the mental development resulting from interactive digital media play experiences causing change in personal identity. Sara M. Cole is a filmmaker and independent scholar. She teaches media and culture courses and makes low-budget movies in Baltimore, Maryland. Her newest class, The Language of Political News, will be offered through Osher at Johns Hopkins University in Spring 2017. Dr. Cole’s past publications address concepts of gender representation and connections between work and play.